No matter how many baked goods I crank out, chocolate chip cookies will always be a favorite. There is something so homey and comforting about them. Crisp around the edges with chewy, buttery centers, and chock full of chocolate chips. What could be better? Is it even possible to dislike chocolate chip cookies? Then there's cheesecake. Rich, creamy, smooth cheesecake. 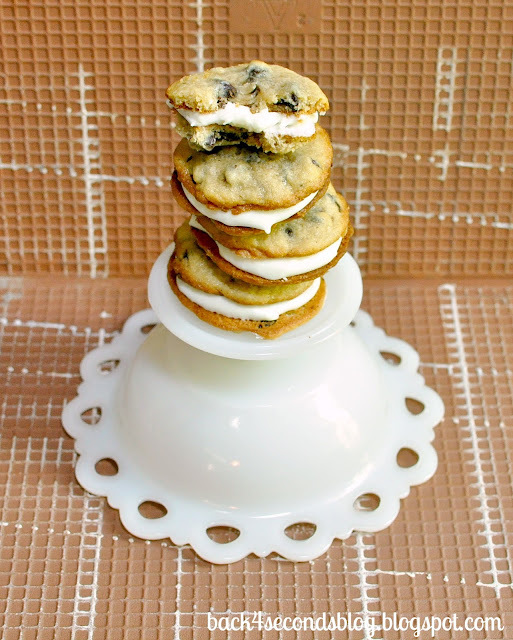 Pair it with your favorite chocolate chip cookies and you are in dessert heaven. Try them frozen for a delicious treat on a hot day. Perfection. hey, who ate that cookie pie? Cream together the butter and sugars until light and fluffy. Add in the vanilla and eggs one at a time until well blended. Slowly add in the salt, soda, and flour and beat until incorporated. Stir in chocolate chips. Drop by spoonfuls onto ungreased baking sheet and bake for 6-8 minutes or until lightly golden brown. Let cool on wire racks before filling. Beat cream cheese, butter, and vanilla until fluffy. Add sugar and beat until creamy and smooth. If needed add a splash of milk to thin. Spread onto half of the cookies and top with the remaining cookies. Also delicious frozen! I'm not a big cheesecake eater, but that would change once I ate these little beauties! Great idea for a cookie pie! Such an awesome idea. 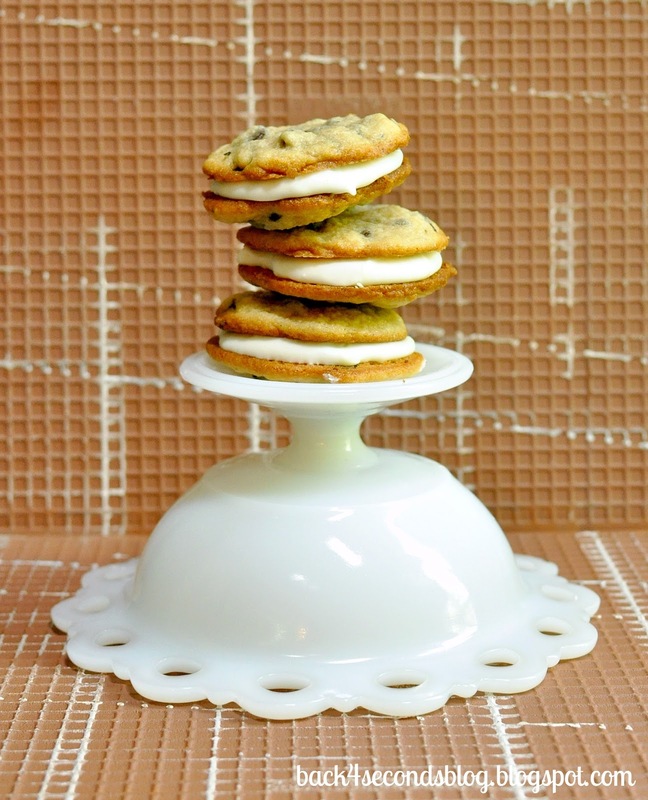 LOVE sandwiching anything between cookies - then you can eat two! I'm on a total cream cheese kick right now and the thought of spreading cream cheese frosting between two CCCs is making me VERY hungry right now. I must make a batch of cookies ASAP. This is so creative Stephanie! 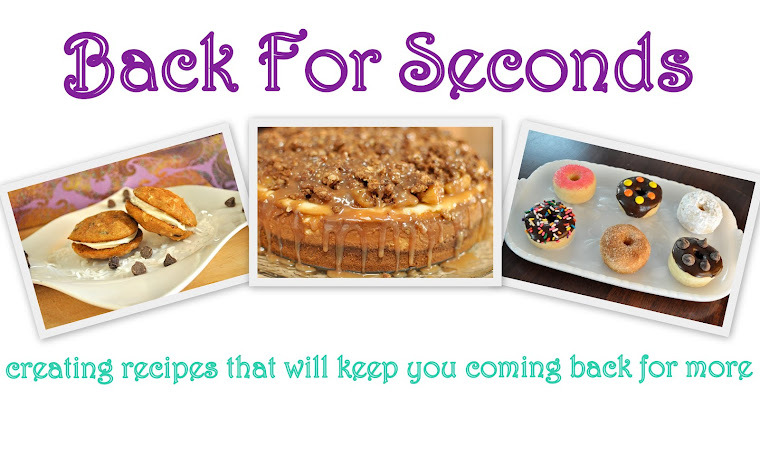 All of your recipes look AMAZING! I'm your newest follower - found you on Happy Hour Projects! come say hi at nichollvincent.blogspot.com and have a lovely day! Love, love, LOVE chocolate chip cookies--and with cheesecake in the middle? You're speaking my language, girl! Visiting from Wednesday Whatsits. You've taken chocolate chip cookies to a new level. Yum! Ooh! They look so yummy! Such a fantastic idea! I can't believe I've never tried this combo before. Pinned! What a match made in heaven! These look FAB-U-LOUS! Why do you keep doing this to me? I'm never going to get around to making all the yummy goodness you keep posting! Thanks for sharing! Yep, I'll eat that stack! Yum, yum, yum! Could go for that stack right now. Oh they looks extremely irrisistable, thank so much for the recepie! Yum!! I have to try these! Thanks! Chocolate chip cookies are always a favorite in my house too, but I absolutely love the addition of cheesecake! These sound amazing!! Thank you so much for linking up to Tasty Thursdays last week. Hope to see you again this week!! You are NOT good for my diet! Love anything chocolate chip! Thank you so much for joining ON THE MENU MONDAY with this delicious recipe! I have a weakness for cookie sandwiches in general and now you have gone and put cheesecake in between them? I am in trouble. Did not know cheesecake and cookies could be mixed like this. This is way better than Oreos in my opinion. I gotta try this recipe out this weekend. I'm glad I stumbled on your blog from the made with love Link up! Hello! I’m stopping by from Mom’s Test Meal Monday’s link party (I’m late!) This looks so tasty, oh man! Can I live with you? :) I hope you’ll come visit me at jugglingactmama.blogspot.com. Happy Tuesday!! 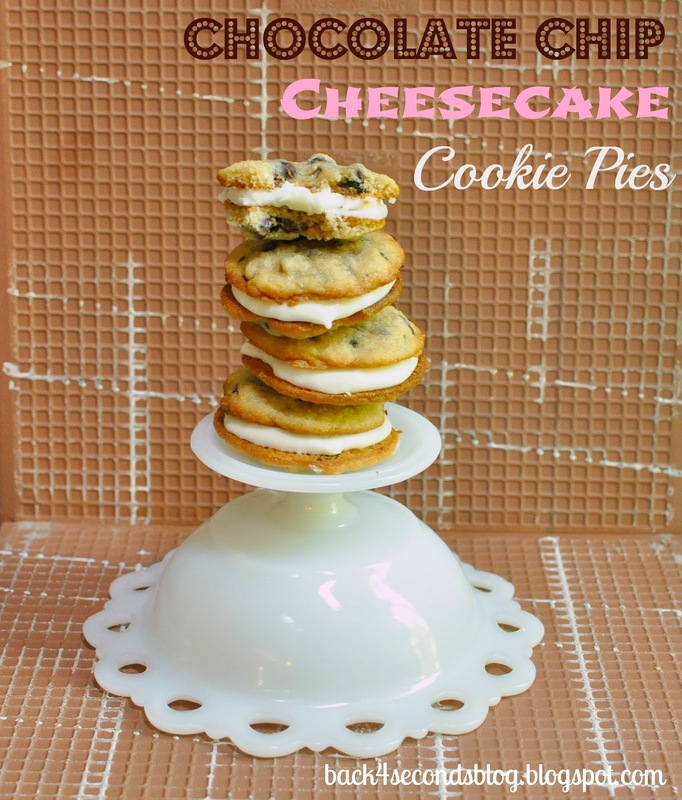 Oh wow, cheesecake and chocolate chip cookies! These look fantastic! Thanks for sharing at Showcase Your Talent Thursday! Delish! Thank you for sharing this at Saturday Show and Tell. I can't wait to see what you have for this week! I look forward to seeing you there. I hope you will link up more great recipes tomorrow. What a great combination! Perfect for these hot summer days -- Thanks so much for sharing on Busy Monday!